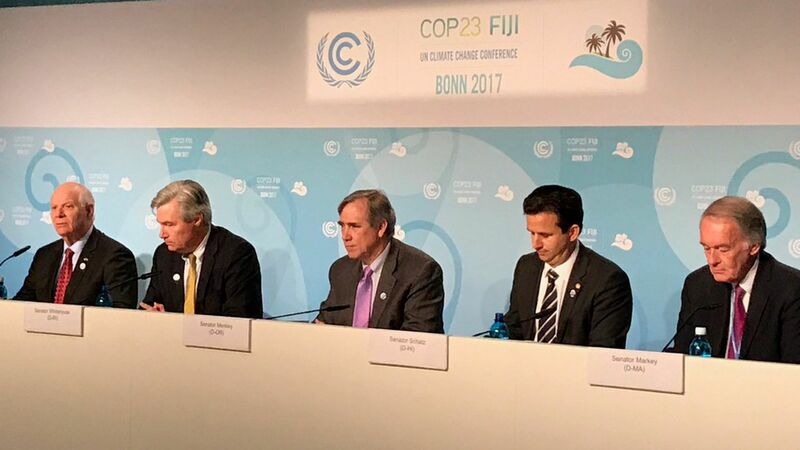 A group of five Democratic senators attending a climate conference here in Bonn, Germany, agree climate change is an urgent problem but are conflicted over whether carbon-free nuclear power should be part of the solution. Why it matters: Nuclear power, which provides about 60% of America's carbon-free electricity, is facing a series of economic challenges, along with persistent worries about safety and how to store its radioactive waste. Nonetheless, the United Nations, which is hosting this conference, and the International Energy Agency have issued studies saying nuclear power is essential to helping the world cut its carbon emissions to levels scientists say we must. What they said: The senators — Ben Cardin of Maryland, Sheldon Whitehouse of Rhode Island, Jeff Merkley of Oregon, Brian Schatz of Hawaii and Ed Markey of Massachusetts — were asked during a press conference whether they supported nuclear power. Two responded. Whitehouse said there's bipartisan support to pass measures in Congress advancing nuclear technologies and helping keep open current reactors facing economic challenges. He didn't explicitly say he supports nuclear power, though he has in the past. Markey, sitting a few seats down, didn't explicitly say he opposes nuclear power, but that was the thrust of his comments. Citing the growth in renewable energy, he says there aren't any "meltdowns to worry about." What they're not saying: A lot. I interviewed Cardin, Whitehouse, Merkley and Schatz yesterday, and asked them all about nuclear power. They told me they supported it, albeit some more cautiously than others, and all while emphasizing safety must be prioritized. "Anything that is a low-carbon solution has to be pursued, and anything that can get bipartisan support ought to be pursued," said Schatz. "That's not to say nuclear power is necessarily a solution in most instances, but there may be instances where it's the best solution." "I think it can be part of a clean energy environment," Cardin said. "I'm not saying we've solved any of the problems with fuel storage, but I think in terms of the big vision of saving our planet, it's worth exploring that strategy," Merkley said. "If safety is not compromised, if economics are not compromised, if nuclear nonproliferation issues are not compromised, then I support nuclear power," Markey told me after the press conference in an interview. "If they have to be compromised in order to accomplish that goal, then no I don't. And thus far they have not been able to 30 years overcome those obstacles." What's next: The Trump administration is hosting an event Monday saying that nuclear power, and cleaner fossil fuels, must be part of the solutions to address climate change.